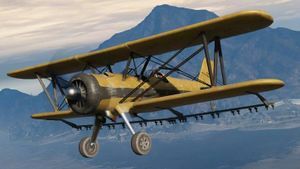 A Duster in Grand Theft Auto V.
The Western Company Duster is an utility biplane in Grand Theft Auto V.
The Duster is evidently based on the Stearman Model 75. It is available only in a junky yellow paintjob with chrome trim. The Duster is possibly the slowest and bulkiest fixed-wing aircraft in GTA V. It is not suitable for pursuits or high-speed travel, and is best used for leisurely flights over San Andreas. Cropduster, the equivalent vehicle in Grand Theft Auto: San Andreas. This page was last modified on 31 March 2014, at 14:26.